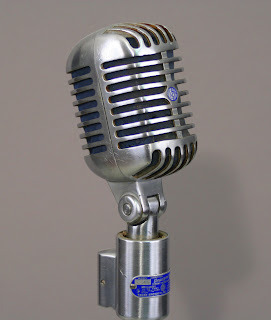 This is the first of I hope a series of author interviews. Kicking it off is author Paul Burman. 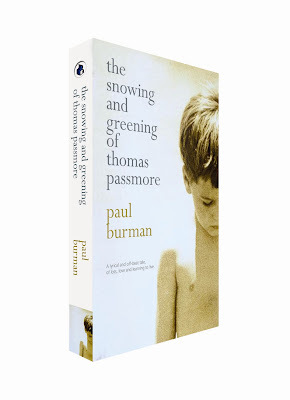 Paul's first book is due out next March from Paperbooks and is called The Snowing and Greening of Thomas Passmore. Born in Duston, Northamptonshire, 1957. Went to Kingston Poly to read Literature, prior to licking stamps in the Post Office for three years. Attended University of Wales in Cardiff to acquire teaching accreditation, and consequently survived teaching in Swindon for six years. Emigrated to Australia at age of 32, with wife and two children, after Margaret Thatcher was returned for a third term of office. Lived at six different addresses in South Australia and Victoria in our first six months, but settled in Port Fairy, where we’ve lived for seventeen years. Currently Head of English at a large state school in Warrnambool. Will have to emigrate to the moon later this year if John Howard is elected Prime Minister yet again. What’s your ideal night out or in? The ideal night involves not having to bring any work home (no correction, no reports) and having the time and energy to write or read and go for a walk along the beach, and sometimes to watch a film. If it’s the weekend, I particularly enjoying sharing the cooking of a meal with my wife and having friends round, so we can spend the evening eating, drinking, chatting, being silly and laughing. Way too many to mention here and the list is always growing, but I’m a big fan of Raymond Carver’s short stories and of Haruki Murakami’s narrative style, and of Tim Winton’s novels, and, and ... and I have to stop there because if I began mentioning individual titles (Dirt Music, The Wind-up Bird Chronicle, Will You Please Be Quiet, Please ...) the list would go on and on. Once started, I couldn’t stop. And, of course, then I’d have to distinguish between those books that have had an impact on me for reasons I can’t easily identify and those books which I admire as technical masterpieces (Of Mice and Men, Slaughterhouse 5, The Curious Incident of the Dog in the Night-time ...) and---oops, there I go. Stop! I remember trying to write a film script when I was 6, and can’t recall ever losing my interest in writing since then. Of course, there have been other things I’ve wanted to do along the way (I had it mind to be a stagecoach robber when I was 7), but I was certainly plugging away at short story and poetry competitions as a teenager, and writing the beginnings of numerous novels (I used to be one of those annoying kids who wrote to authors asking for advice with my latest story). I studied Lit. at Kingston because Creative Writing courses hadn’t been invented, although I had looked into getting jobs at Blackwells and Foyles when I left school so that I could earn a living amongst books and spend all my spare time writing. When I was at Kingston Poly, I had a brief opportunity to be part of a group who worked with the playwright Olwen Wymark, and this was great fun, but I probably didn’t start writing with any clear sense of commitment and direction until I was in my early twenties. Haven’t stopped since. I’m an addict. Had one near-miss with an agent and almost got burned once. The first occurred just before I emigrated, when the agent felt confident enough about an MS to take it to the Frankfurt Book Fair---how excited I was---but came back from that Book Fair having decided to stop representing fiction and to pursue non-fiction instead. Ouch! The second occurred a few years back when I almost got suckered by an American “agency” who took me through a number of stages in the build-up to representing me before asking me to pay for the process; the alarm bells rang and I found them exposed on the internet site Writer Beware as a con. So much for the disappointments. Prior to obtaining my first book deal (PaperBooks accepting The Snowing and Greening of Thomas Passmore), I approached a number of agents in the UK and Australia, including a couple of agents who’d liked my last MS but ‘hadn’t felt confident about finding an appropriate publisher’ and who’d asked to see my next MS. With unusual speed, I received rejections from every one. Although a couple of glowing reader’s reports accompanied the rejections, it felt like I’d taken two large steps backward, particularly as it was clear that fewer and fewer publishers were willing to look at manuscripts unless they’d been submitted via an agent. It was about this time that I read an article by Keirsten Clark at PaperBooks and decided that, having dispensed with agents, this would be the first publisher I’d approach. Two weeks later, I received an e-mail asking to see the remainder of the MS and---well, the book comes out in March 2008. Thomas Passmore wakes from a warm Australian beach to find himself at Heathrow Airport on a winter's morning. Burdened with an unshakable sense of déjà vu, it soon becomes apparent that something strange has happened to him and that he has to try and piece together the fragments of his life and learn to live fully in the present ... or remain a sleepwalker forever. Haunted by his father’s suicide, his mother’s rejection and by vivid dreams of a figure from his past, his increasingly bizarre journey takes him through childhood, a self-destructive adolescence, and into a world where his struggle to live again is mapped against the struggle between winter and spring, night and day. It's an interesting title, how did you come up with it? The literal response is that I came up with the title after researching that wonderful pagan deity the Green Man (good old Google). 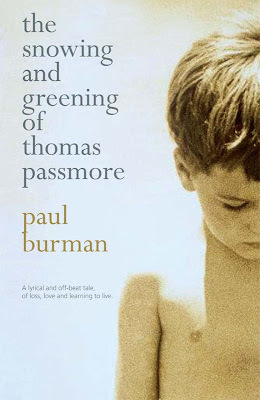 I played around with a thousand and one phrases until I arrived at one which I felt was lyrical enough and which encapsulated a key aspect of Thomas Passmore's story. Beyond this, I'm wary of saying too much and spoiling (by explaining away) a turn of phrase that, I hope, excites curiosity. The safest answer would certainly be: Read the book and all will be revealed. How does it feel now the book is approaching publication? Nerve-wracking! I didn’t get a proper night’s sleep for about three weeks after Keirsten Clark at PaperBooks offered to take it on, worrying that she’d soon realise what a mistake she’d made and that she’d be looking for a way to politely back out (or would return from a Book Fair and decide to focus only on non-fiction). After all, five novels not only generate enough rejection slips to wallpaper a room but also a few buckets of self-doubt to paste the things up with. Seven months later, although a little of the anxiety is still there, I’m using it much more positively to ensure my approach to editing is as thorough as possible and that The Snowing and Greening is exactly the way I want it to be ... and towards shaping the way I write generally. Whilst I get excited by cover designs and seeing the book advertised on Amazon and at Blackwell Online, etc, and by anything good that happens for PaperBooks (see their website http://www.paperbooks.co.uk for recent successes with Borders’ Book Group Picks for Jon Haylett’s Cry of the Justice Bird and Jessica Gregson’s The Angel Makers), I suspect that I won’t fully believe that The Snowing and Greening is going to actually get published until I’ve got a copy in my hand and I can see it in a bookshop. Whilst making sure that the manuscript is as polished as possible, save enough money to send it to a reputable Manuscript Appraisal Agency, and be prepared to act on the advice they offer in return. Aim to cut every draft by 25%. Regard the deletion of words as an act of creativity, and always be prepared to take the sentence, paragraph or chapter that you’re proudest of and delete it if it doesn’t add significantly to the story. Write because you enjoy writing and write what you would enjoy reading. Pre-order Paul's book at Amazon. Check out Paul's blog at Paperbooks. Great interview. I'm definitely ready to buy the book, it sounds very intriguing. Thank you - you make the life worthy living. Your interviews (your concern with the success of other) testify that my dreams aren’t just fantasy -that people are interested in life of other until now. Thanks, Charlotte, Tomas and flower-smellers for reading and responding to the interview. A big thanks to Mike for setting up the interview. I've received heaps of tremendous comments via e-mail, Facebook, etc. Happy reading! What a great interview. Good ol' Burman.